Let’s talk nut milk. In the past I’ve often used store bought nut and seed milks (almond, hazelnut and hemp), but now, I prefer to make my own when time allows. I’ve found it more satisfying to make it myself as I can adjust the sweetness, creaminess and flavor to suite my own tastes and needs. Also, I feel better about giving it to my family knowing my homemade alternative milk is free of preservatives. Since my last nut milk post, Amygdalate (Almond Milk), I tried making cashew milk, it is said to be the creamiest of all homemade nut milks. I confer! It’s also super easy to make. As cashews blend entirely in water, its milk does not require the need to strain nut pulp through a nut milk bag. Cashew milk retains all of the fiber and nutrients that are present in the cashews. This was my first time making cashew milk so I didn’t really know what to expect. Cashews have never been on the top of my list of favorite nuts so I was afraid the flavor of cashews would be overpowering, but that was not the case. I can honestly tell you that I was very pleasantly surprised. So was my husband. He looked at me with a good bit of suspicion before tasting it. I couldn’t blame him. However, he quickly smiled and said, “that’s actually pretty good, can I have some more?” Then my baby took a sip and said, “Mmm” and then gently tapped his two little index fingers, communicating “more” in baby sign language. Ahh, success—a healthy drink the whole family could enjoy. Alone, cashew milk is was a refreshing drink, but we also used it for making smoothies, oatmeal and porridge. Creamy deliciousness! Not only is it delicious, cashew milk is full of health benefits. Cashews have a lower fat content than most other nuts, and most of their total fat is unsaturated. Cashews are also a good source of magnesium, a mineral that helps regulate nerve and muscle tone; phosphorous, which binds with calcium to help strengthen bones; and copper, which is a co-factor of enzymes necessary for proper bone metabolism. Finally, cashews are also a concentrated source of sleep-promoting tryptophan. I’m sold. I will definitely make it again, and again, and again! Did I already mention how easy it is to make? Here, I flavored my cashew milk with cardamom, vanilla and dates. What’s nice about making your own nut milk is that you can use ingredients that suit your taste. Have you tried making cashew milk? If so, how do you flavor yours, I’d love to know. Please leave your comments in the comments section below. Also, if you haven’t already done so, be sure to enter to win the book giveaway and check out my message to readers for the new year and the upcoming book club. Teff is considered to be the smallest grain in the world. 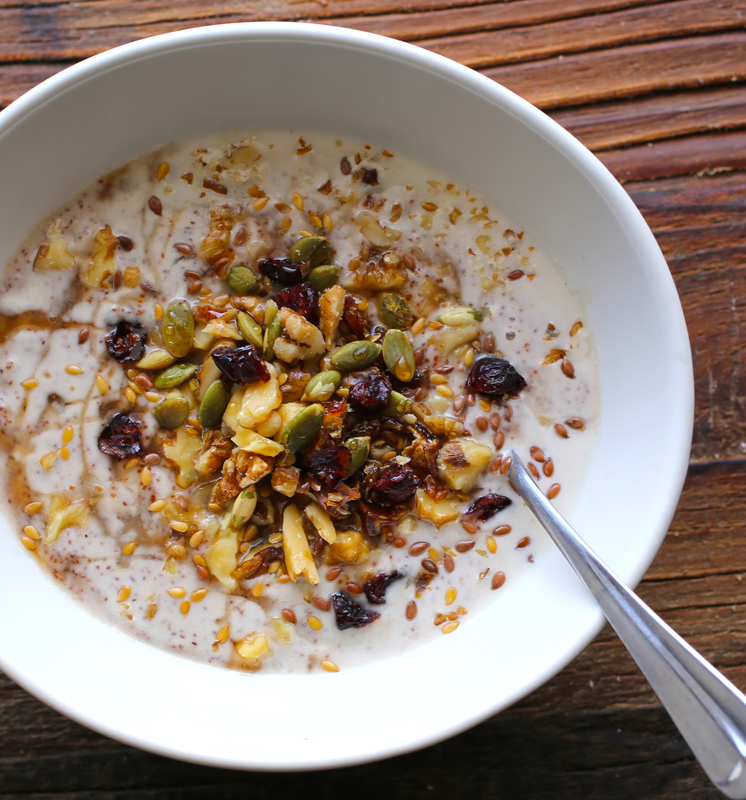 It has a nutty flavor and packed with nutrients like calcium, protein, fiber, iron. The most valued grain used to make injera, teff has been a staple of Ethiopian cooking for thousands of years. It has all the amino acids required to be a complete protein and is naturally gluten free. Heat a saucepan over medium heat. Add teff. Stirring frequently, toast until the grains begin to pop, about 5 minutes. Add cashew milk, buckwheat, rolled oats, cardamom and cloves. Stir well and bring to a gently boil. Reduce heat, simmer until teff, buckwheat and oats are tender, about 15-20 minutes. Add vanilla, dates (if using), maple syrup, agave or honey. If the porridge is too thick, add more milk or boiling water to reach you preferred consistency. Remove from heat. 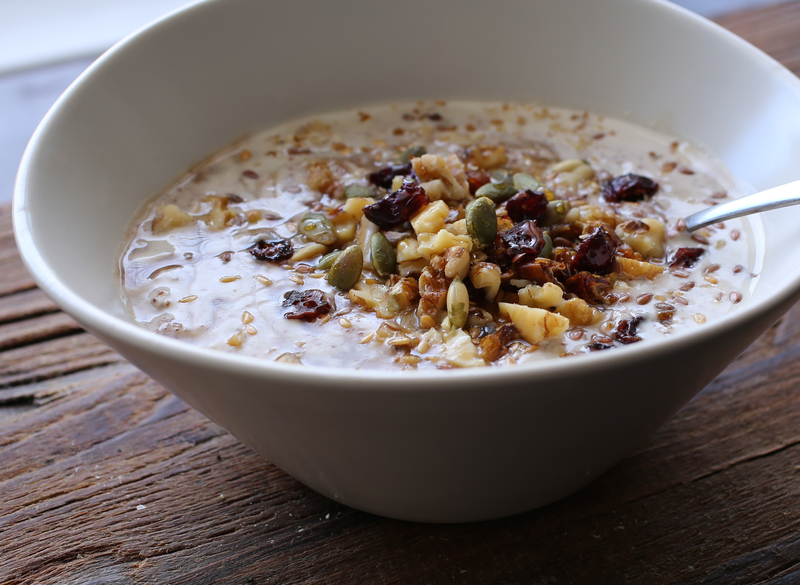 Ladle into bowls and serve topped with walnuts, dried or fresh fruit, flaxseeds or other seeds of choice. Drizzle with maple syrup, agave or honey. The picture is below is of the porridge with less toppings. Place the raw cashews in a bowl and cover them with water. Soak cashews overnight. The next day drain the cashews and rinse until clear, using plenty of fresh water. 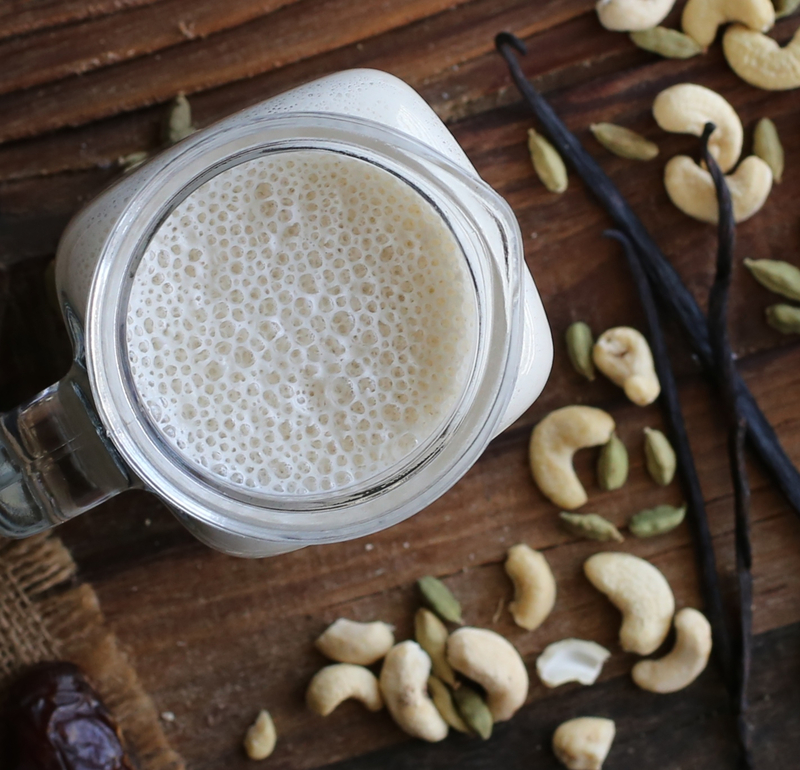 Put the cashews in a high-speed blender and add 2-3 cups of water, dates, vanilla, cardamom and salt and blend at high speed until very smooth and creamy. Adjust ingredients to suit your taste, adding more or less water, dates, and cardamom to suite your taste. Less water yields creamier results. As I add water, I taste the milk until it reaches the consistency my family and I prefer. Martine’s Notes: I used my VitaMix, a very high speed and powerful blender. If your blender does not fully blend the cashews and dates smoothly, you can easily strain your cashew milk through a fine mesh strainer or nut milk bag. As I usually sweeten my milk with dates, I don’t add dates to the porridge so it’s not too sweet. If you’re not a fan of cardamom or dates, feel free to alter this recipe and flavor your cashew milk and/or porridge to your liking. Cinnamon, vanilla and honey (or other sweetener) are great options! Teff has a strong flavor that some believe to be an acquired taste. If you’re not too sure, you can always start with using just 1/4 cup of teff. Experiment, make this porridge and milk your own and have fun exploring. Please note, as there are no preservatives added, your cashew milk will last only about 3-4 days in the refrigerator. Thank you Martine, It sounds delicious and I will try it right away! Hi Helen, Great! Keep me posted on your results! I hope you love it! Hi Shanna, thanks for your comment. Yes, the beauty of this recipe is that it is quite versatile! I’m looking forward to experimenting with other flavors soon! Please let me know if you try any variations! All the best! Haha! The trick is to buy enough cashews so you can have two bowls of cashews—one to nibble on while the other bowl holds the soaking cashews to make the drink. 😉 Thought of you the other day. Was going to try a dessert with quince paste and perhaps figs. Yum….